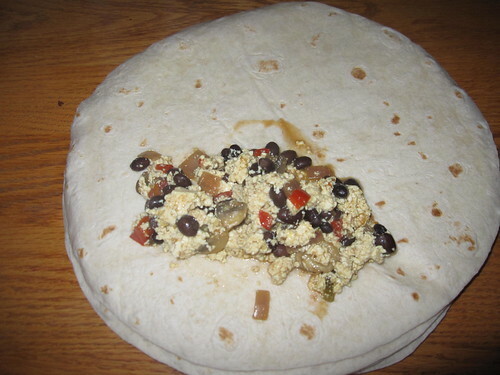 One of the most popular posts I’ve ever done on The Simple Dollar was my post about bulk breakfast burritos, which is fitting because they’re one of my favorite meals. They were loaded with eggs and other goodness to make a delicious little breakfast. Of course, over the years, I’ve refined the burritos a bit. I had finally hit upon a combination that I loved, a mix of ingredients that made my mouth start to water just thinking about it, when I gave up eggs. After a few months, I was convinced by a vegan friend to try replicating the recipe with extra firm tofu replacing the scrambled eggs. I was a bit dubious, but I decided to give it a shot. It turned out to be quite tasty – so good, in fact, that I’ll eat the filling as a meal without the tortilla shell. My family enjoys it for pretty much any meal, not just breakfast. Obviously, you can make this recipe with either eggs or firm tofu. If you’re using eggs, scramble six or eight eggs first and cook until they’re just a bit shy of being done (take them off when you think they’d be done in a couple of minutes, in other words). With tofu, just buy a pound of extra firm tofu and crumble it with your hands. I usually double the recipe for my own purposes, so I’ll make sixteen (or so) burritos with enough scramble to make a meal for the family out of what’s left. This time, I made 16 burritos, everyone in the family had scramble for a meal, and I had enough scramble left over for another meal besides. This adds up to thirteen meals for a total cost of around $16, plus the latter eight meals (two burritos each) were really convenient. The biggest thing you can do in advance is to cut up the mushrooms, tomato, onion, bell pepper, and garlic. Store them all in separate containers in the refrigerator until you’re ready to cook. Get a soup pot – 5 quarts or greater – and add the oil. Turn up the heat to high until the oil begins to smoke, then add the garlic. 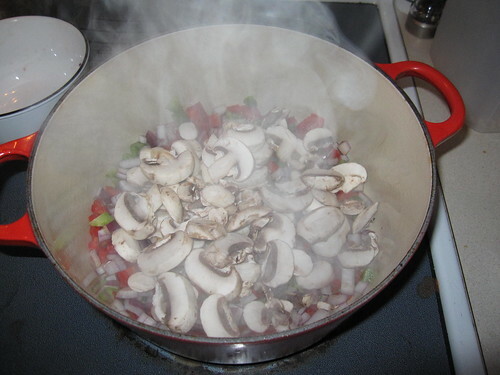 Stir vigorously for fifteen seconds, then add the onions, bell peppers, and mushrooms. Stir this regularly for about five minutes. Lower the heat to medium, then add the beans, tomatoes, and turmeric. Allow this to cook for about two minutes, stirring regularly. 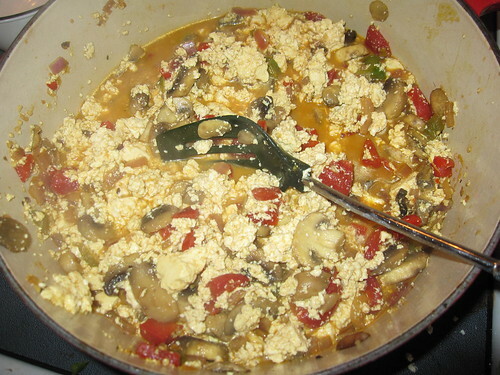 Add the egg or tofu and continue to stir, letting everything cook for about five more minutes. You’re ready to eat! Unless you’re feeding a lot of people, you’ll have a lot of leftovers. I usually turn this into breakfast burritos by adding three heaping tablespoons of the mix to the center of a tortilla using a slotted spoon (allowing any liquid to drip off first), then rolling it up into a burrito shape. I can make eight of these per batch, so here are the sixteen I made with my double batch. I bagged them, two to a quart Ziploc freezer bag. 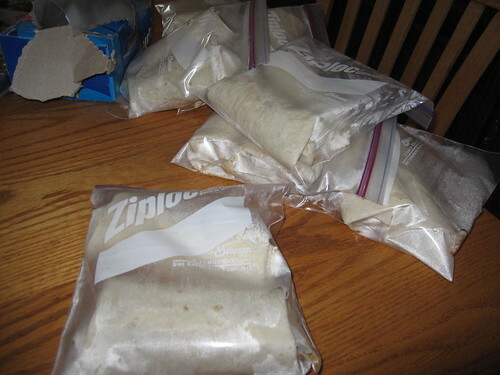 Whenever I’m hungry, I pull out a Ziploc bag, remove the burritos, wrap them individually in a paper towel, then microwave them for two and a half minutes. I remove the paper towels, turn each one around so that the sides that were facing the outside of the plate are now facing the inside, and microwave them for two minutes more. Delicious! You can make them easily transportable by wrapping the bottom in a paper towel or wax paper. 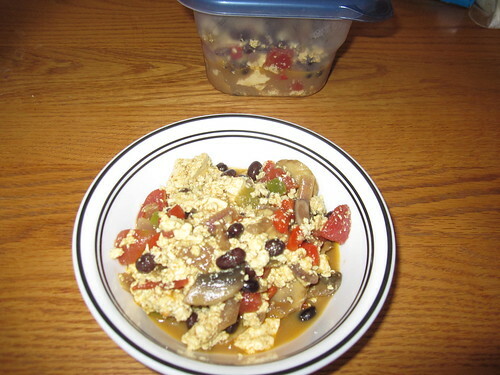 Besides the egg/tofu choice, you can add all kinds of things to this recipe. Cooked sausage, diced ham, asparagus, bacon, salsa, cheese – the list goes on and on. Add whatever ingredients sound good to you and you’ll be happy with what turns out. For me, this is a delicious mix that luckily happens to be pretty healthy, too.